Gigabyte motherboards with H61 chipset have a very disturbing problem when you try to add a Nvidia graphic card to a PCI-Express slot. There is some compatibility problem that we luckily solve. A computer configuration with the same motherboard work perfectly with onboard (Intel HD Graphics). But when we try to add additional graphic card on PCI-Express slot, the computer is stuck right after the start and on the monitor you see only Gigabyte logo. You cannot enter in the BIOS or boot menu. The problem was solved with a simple BIOS update. 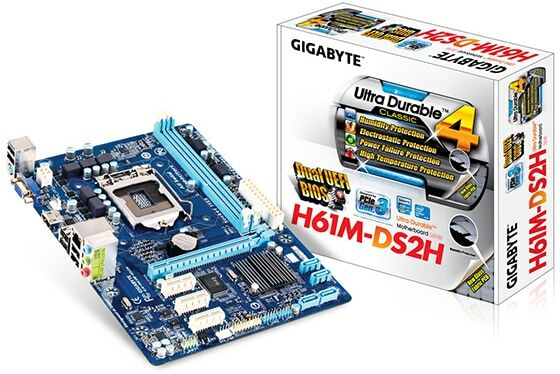 Here we gonna show the procedure for BIOS update for the specific motherboard that we have – GA-H61M-DS2H rev.2.1. The procedure is similar for the other motherboards also. So, we remove the nvidia graphic card and we boot the computer with the onboard graphic card. Go to the official support site -> CLICK HERE. In the search type the correct model of the motherboard. From the list select your motherboard and click on BIOS. In our case the are list of more BIOS versions. We choose the “latest version that is not Beta“. In our case that is BIOS F7, assigned with the green color on the previous picture. After we download the BIOS and extract the rar file, we gonna need the software for update of the BIOS. Gigabyte called it @BIOS that can be downloaded from the same page selecting Utilities from the drop down menu that before we select BIOS. READ THIS BEFORE CONTINUE ANY FURTHER! Upgrading BIOS of the motherboard is a risky operation. If you are not a sure what you doing, better not to 🙂 . Instead, always you can take your computer to a pc service when this procedure can be completed successfully. This entry was posted in Hardware and tagged compatibility, Gigabyte, Nvidia by Tome Trajkov. Bookmark the permalink.